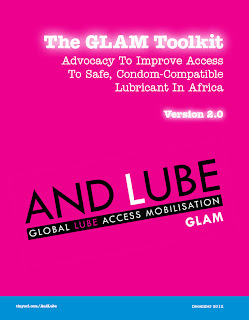 Today IRMA, in collaboration with amfAR and AVAC, is excited to release a re-designed Version 2.0 of the GLAM Toolkit: Advocacy to improve access to safe, condom-compatible lubricant in Africa. The Toolkit is now available in French in addition to English – making it more useful for Francophone speakers in Africa – and the new design makes it easier for advocates to use. The Toolkit provides background on the status of lubricant (lube) access in Africa and suggests potential strategies for civil society and government partners to secure and distribute sustainable supplies of safe, condom-compatible lube. Global Lube Access Mobilisation (GLAM) is a campaign of IRMA’s Project ARM (Africa for Rectal Microbicides) initiative. They are available on the IRMA blog herewhere you can also learn more about GLAM and Project ARM. And the Toolkits can be downloaded as PDFs in French and English from the IRMA website. In April, IRMA, amfAR and AVAC announced three grants to organizations in Liberia, Zambia and Nigeria to campaign for access to safe, condom-compatible lubricants in their communities. Learn more about these grants here.